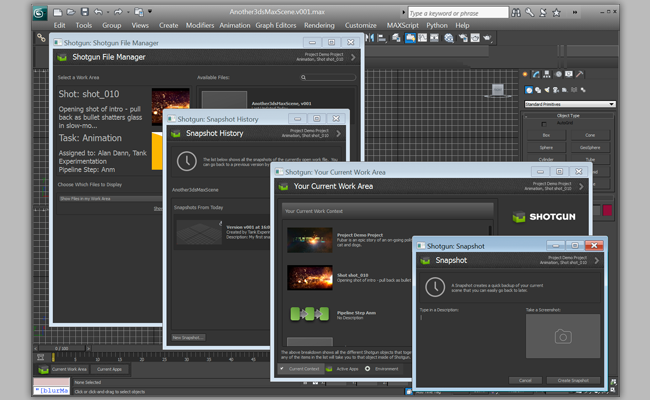 The Shotgun engine for 3ds Max Plus provides a bridge between the 3ds Max application and the Shotgun Pipeline Toolkit. The engine supports PySide and all Multi apps, meaning that you can run our standard apps inside of 3ds Max - the same apps that also work in Maya, Nuke etc. This engine uses the 3ds Max Plus python API. This engine connects Shotgun Pipeline Toolkit (Sgtk) and 3D studio Max via Max Plus' Python support. If you have access to the Shotgun Pipeline Toolkit, you also have access to the source code for all apps, engines and frameworks in Github where we store and manage them. Feel free to evolve these items; use them as a base for further independent development, make changes (and submit pull requests back to us!) or simply tinker with them to see how they have been built and how the toolkit works. You can access this code repository at https://github.com/shotgunsoftware/tk-3dsmaxplus. Description: Controls what apps will run on startup. This is a list where each element is a dictionary with two keys: 'app_instance' and 'name'. The app_instance value connects this entry to a particular app instance defined in the environment configuration file. The name is the menu name of the command to run when the 3dsMax engine starts up. If name is '' then all commands from the given app instance are started. 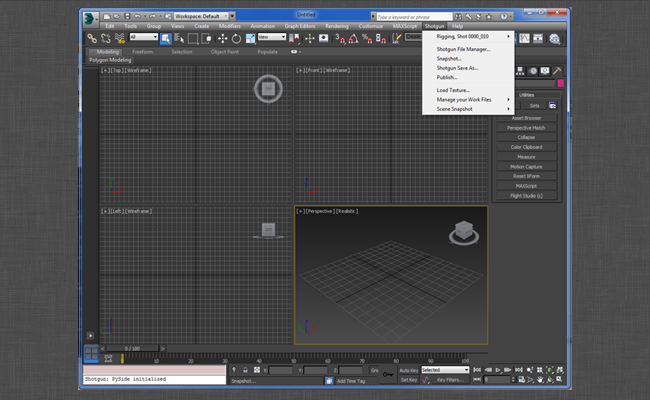 Description: Comma-separated list of tk-3dsmaxplus plugins to load when launching 3dsMax. Use of this feature disables the classic mechanism for bootstrapping Toolkit when 3dsMax is launched. Therefore, if any plugins are specified using this setting, the first one in the list must be responsible for starting Toolkit when 3dsMax is launched. Ups the maximum-supported version of 3ds Max. No functional changes to the engine, otherwise. Simplifies window parenting logic for modern Max versions. In modern 3ds Max, we're able to get the main window via MaxPlus. In that case, we can skip the older, more complicated logic for window parenting and use the more standard approach taken by most other integrations. Minor change to ensure compatibility with 3ds Max 2019 update 3. Now ensures that the work folder exists when saving the scene at publish time. Dockable panels, Plugin, Software support and dropped support for max 2015. Upgraded to better handle python ssl. Bumped major supported version. Adds support for 3ds Max 2017 and engine-level styling. Bug fix for Qt dialog management during maxscript operations that launch modal, native dialogs. It's required that we hide any open Qt dialogs during these operations, as native Max dialogs that are modal pair poorly with Qt dialogs that are active and not locked away like the rest of Max. Our logic attempted to do this, but ended up showing otherwise-hidden dialogs that shouldn't have been shown, and also had the unintended effect of triggering certain operations once per existing dialog (like merge operations from the loader app). Menu action fixes when multiple Max sessions are run at once. The bug cropped up when multiple Max sessions are run concurrently. The macros attached to the menu actions changed after the second session's Shotgun menu was built (Max caches the menu layout, including the macros, to disk) and the first session would call the macro defined in the second session. Because we keyed our cache of AppCommand objects off of the Python object ID, the lookup to find the AppCommand in the first session looked for the ID of the second session and fail. Modal dialogs are no longer attached to Max's main window. Modal dialogs behave properly when not explicitly attached to Max's main window via MaxPlus. When they ARE attached, however, keyboard and mouse inputs are blocked for both Max and the modal dialog. As a result, we no longer attach modal dialogs to Max's main window. Parents Qt dialogs to Max's main window. As of the 2016 SP1 release, Max can have Qt widgets parented to its main window. The Maxplus engine will now attempt to do so for any version of Max of that release or newer. Logging using engine.log_* is no longer blocking. A deadlock would occur when a background thread was logging through the engine's log methods while the main thread was waiting for the background thread to complete. Note that this fix requires Core API 0.16.35. Enabling debug logging would cause 3ds Max to hang - this has now been fixed. The previous fix for the Python SSL slowdown bug wasn't being applied correctly - this has now been fixed. Fixes crashing issues relating to qt dialogs and max modal. Fix an exception that stopped the engine from being created with favorite menus. Changes default behavior for menus by making them active in case the engine hasn't started properly. Added guard to restore menu in case of exception thrown in modal dialogs. Fixes a crash when trying to use the shotgun menu while a modal dialog is opened. Updated engine to work with MaxPlus instead of Blur's python distribution for 3ds max, thus removing the dependency.